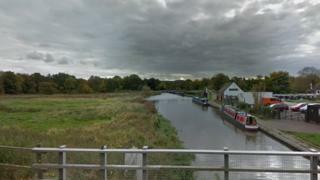 A woman pulled out of a canal near Stafford has died. She was found near the junction of the Trent and Mersey Canal and Staffordshire and Worcestershire Canal on Tuesday evening. The woman, in her 60s, was taken to Royal Stoke University but died later that evening. Police are investigating and said a man, also in his 60s, is helping them with their inquiries. Staffordshire Police responded to calls that the woman had been spotted in the water at Mill Lane, Great Haywood. Det Insp John Quilty, said: "We're very keen to speak to people who may have been in the area at the time. "This is a busy spot for boaters and walkers, close to Shugborough."